Fortunately, the opportunity to actually engage patterns in Nature comes to me often. As time passes, I will be sharing some of these experiences and my thoughts about these experiences with you. I like this place for three reasons. First, there is a pristine feeling because few people go there. There are no public facilities and, given some ecological common sense, you can camp anywhere. It is wonderfully quiet. Except for occasional aircraft noise, you can hear Nature without the noise of humanity. Second, Ironwood has magnificent early morning light that changes color as the sun rises. The changing light casts a magnificent golden glow on the plants and the nearby mountain. As an avid nature photographer, I’m thrilled. But, my third reason for loving this place is the most important. Ironwood is home to some very interesting patterns in Nature. The most obvious is the crazily shaped arms of the Saguaro cactus. But my favorite is the Ironwood trees, along with the Palo Verde and Mesquite, and how they act as nursery plants to protect the Saguaro. This demonstration of a temporal symbiotic pattern in Nature fascinates me particularly because it involves preferential attachment — a key factor in the reason why patterns in Nature are what they are. Let’s start first by talking about nursery plants. Seedlings from certain species germinate only in certain selected spots. One criteria for the Saguaro Cactus seed to germinate is protection from the harsh desert sun. Wind and stream water move the Saguaro seeds until some are caught up at the base of the Ironwood, Palo Verde, and Mesquite plants. The leafy branches offer the needed protection and the seed germinates to become a seedling. And there the cactus sits for its entire long life that averages 200 years. All over Ironwood you can see this nursery plant arrangement with a large cactus poking its body up through the top of a Palo Verde or Ironwood tree or a Mesquite bush. Likewise, many young cacti are dwarfed by their nursery plant. But, I also see many Saguaro cacti without nursery plants. The Palo Verde has an estimated lifespan of 100 years. The Mesquite has a lifespan of 40-110 years. The Saguaro outlives both of these nursery plants. That is why one sees many solo Saguaro. Their nursery plants have died a long time ago. But, the Ironwood Tree lives 300 to 600 years — outlasting the Saguaro. That is why there are many large Saguaros living within the branches of the Ironwood Tree. And that is why I see dead Saguaros embraced by the Ironwood. So, what about “preferential attachment”? Patterns in Nature are what they are because they are interconnected to other patterns in Nature. Preferential attachment describes the way that patterns in Nature connect. It describes the character of the connection network in which a pattern exists. In fact, along with growth, preferential attachment appears to be an essential process in the formation of patterns in Nature. If you want to buy a book on-line, you would prefer to connect to Amazon rather than to my blog site. Many more people want to buy books on Amazon than to read my blog. Amazon, with its reputation, preferentially draws people to its major Internet hub site. 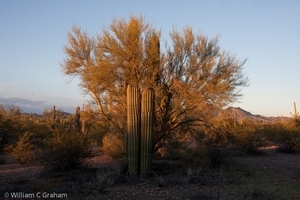 One could say that the Saguaro seed “prefers” to make a connection with the Ironwood, the Palo Verde, or the Mesquite. While this process lacks any “conscious” effort it is clear that the seed will not germinate under creosote bushes that drop a chemical that kills any seed growth. Other plants lack the ability to entrap the seed. And, a Cactus seed lying out in the open will die due to exposure from the sun — even if water is available. So, there is a pattern to who and how a Saguaro seed becomes protected. Preferential attachment, the way something connects, is indeed a pattern in Nature. It is the reason that Nature’s networks are the way they are. It is ubiquitous. It drives social networks (there are only certain people you prefer to communicate with), ecosystems (predators prefer only certain prey – there would be no food chain without a preference for prey), and our own metabolism (without any consciousness molecules prefer to bond only to certain other molecules). I worked as the Grounds Curator for Tohono Chul Park in 1987, and the pattern you refer to is evident for many of the saguaro growing there too. From a permaculture point of view, this pattern is a natural plant guild system. The nursery trees are all legumes which fix nitrogen, and they are deciduous, dropping their nutrient rich leaves as mulch. This creates enhanced conditions for the saguaro seeds, which may be drop by birds that feed on the saguaro fruit and use the trees as a roost. In the case of the palo verde and mesquite, when the trees die back, they release nutrients to the saguaro, often at the point whent the saguaro is experiencing its greatest growth rate. It’s all an example of the environment being holocenotic: everything in it influences and is influenced by everything in it.